St Joseph and St James Church, Follifoot, was opened on 22 October 1848, following Sir Joseph Radcliffe of Rudding Park granting part of Longlands field for the erection of the church as a chapel of ease for the Rector of Spofforth, the Reverend James Tripp to provide services every Sunday, Christmas day, Good Friday and for funeral and other services as appropriate. The deed of conveyance for the land and chapel was signed by Sir Radcliffe on 2 November 1850. The church is situated on the edge of the village on the Plompton Road, built of red sandstone with a slate roof, it consists of a south porch, an oblong nave with a bell tower on the west wall, a square chancel on the east end and a vestry on the north side. On 16 May 1896 the Lord Bishop of Ripon, William Boyd signed a licence granting publication of banns and solemnization of marriages in Follifoot Church. The document mentions the Right Honourable Baron Leconfield who was patron of the Rectory and Parish Church at Spofforth and the Reverend William Pearson, the Rector. was agreed for the centenary celebrations. The Reverend Pearson was to take Evensong on Friday 22 October, the actual centenary day, followed by a social evening in the school. new position. The nave was completely reseated with comfortable pews, churchwarden’s staves, kneelers, organ stool, two coffin stools and notice boards have been donated and the church had been cleaned and re-decorated throughout. The church re-opened on 6 February 1966 with a special thanksgiving service. In 1968 Mr Clarence (Clarrie) Cullingworth retired after many years service as a churchwarden. To mark his retirement, it was decided to put the bell and rope into good order. However, an architect’s inspection revealed that the bell tower was unsafe. The original plans for a simulated bell tower did not meet with approval and it took until 1975 for project for the refurbished bell and new bell tower to be completed and be dedicated by the Rector at a service on 4 May 1975. Sadly, Mr Cullingworth had died before he could see the work completed. 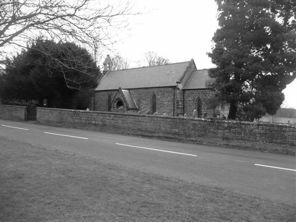 On 1 December 1971, the merger with Kirk Deighton Parish took place and the parish title became Spofforth and Kirk Deighton (with Follifoot and Little Ribston). £15,837 + vat + inflation. A target to raise of £20,000 was set with an incredible response and by September 1993 work commenced, been completed by November with a thanksgiving service held on 5 December 1993.